Everything is at once familiar and strange in Morgan Melenka’s MFA thesis exhibition delaminate. 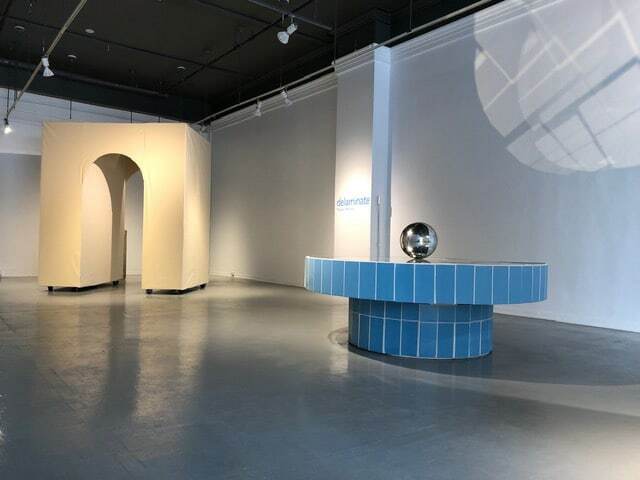 She has reproduced architectural ornamentation and flourishes such as fountains, arches, and bollards – the kind you find in every mall, airport, and town square – inside the Anna Leonowens Gallery, but here these common, everyday tropes of public architecture are recreated in a way that almost purely deals with surface and illusion. The result is an odd and humorous discordance with the concrete reality of the original forms. An archway on wheels is made of paper, not stone. A low mirrored table with a perfectly reflective chrome ball on its center dominates and mirrors the room, inviting us to reflect on its construction and illusive function. At either end are two large bollards or fence posts made with printed images of concrete on paper. They are curiously soft and unimposing compared to the cold hard originals. As with all the work in this show, these forms are created using improvised construction or printed material to mimic the surface of the originals. Oddly, it is in this cheap imitation that similarities between the original and the fake are strongest. The key to understanding this exhibition might be in the title: delaminate. Laminates are very common building materials made in layers (like plywood) and the final layer is often a cheap material printed with the pattern and texture of something expensive (like hardwood or marble) to give the end product the look of something costly at a cheap price. The illusion is given away when the layers are peeled back, which is exactly what Melenka has done here. She has “delaminated” and exposed the inherent fakeness of most modern building materials used in our transient, quickly built, ephemeral public spaces. The way she has constructed these pieces shows us the ridiculous facade and the insincere, generic, ubiquitous, and nonspecific nature of architectural ornamentation in public and commercial spaces. It leads one to worry that a similarly disingenuous veneer might cover all aspects of modern North American life. Morgan Melenka: delaminate continues until March 30.